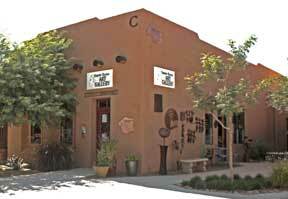 The Feminine Mystique Art Gallery is a pleasant drive south of Tucson. Take I-19 south toward Nogales. Turn Left onto East Frontage Road "E I-19"
Turn Right at La Entrada. Personalized directions can be found and printed by clicking on "Vew Larger Map" text above. Detail of the La Entrada Plaza. Please find us in the center courtyard. We are located in the La Entrada Plaza area right on the frontage road. Come see our wonderful additions, ample parking, and lots of new businesses. The Feminine Mystique Art Gallery is in the center of the plaza . Our center courtyard area offers "Manos Gallery", "CuiTaca".